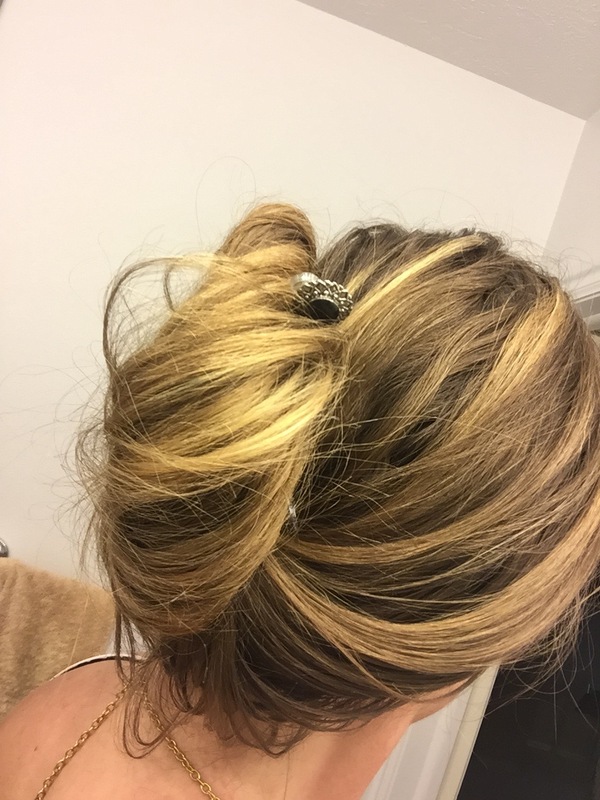 The Lazy Girl’s Guide To HairStyling- Just Get Some of These Fab Hair Accessories! I probably should have titled this blog, style for lazy girls. Because that is what I am, at least when it comes to hair styling! Obviously I’m completely obsessed with it though. I shop it, I try it, I write about it, but what you may not know about me is that if it requires too much work (as in more than 5-10 minutes), I’m just not into it. I’m not even that busy of a woman but I don’t like to take up my time with applying makeup and doing my hair. I just don’t. I keep my hair long because its easier to do. Most days, I kid you not, I just run some styling cream through it and walk out the door. I don’t even bother to brush it half the time. Yeah, seriously. L-A-Z-Y girl! The thing is, there is enough going on in most of our lives, we don’t need be to wasting time with styling. There are actually some incredibly styling tools out there available to make you’re like sooo much easier! So yeah, lets talk about hair. I told you already I keep mine long. On days when my hair is dirty, (and you can bet there are lots of them, especially because I have dry hair! ), I tend to just throw my hair back in a ponytail. 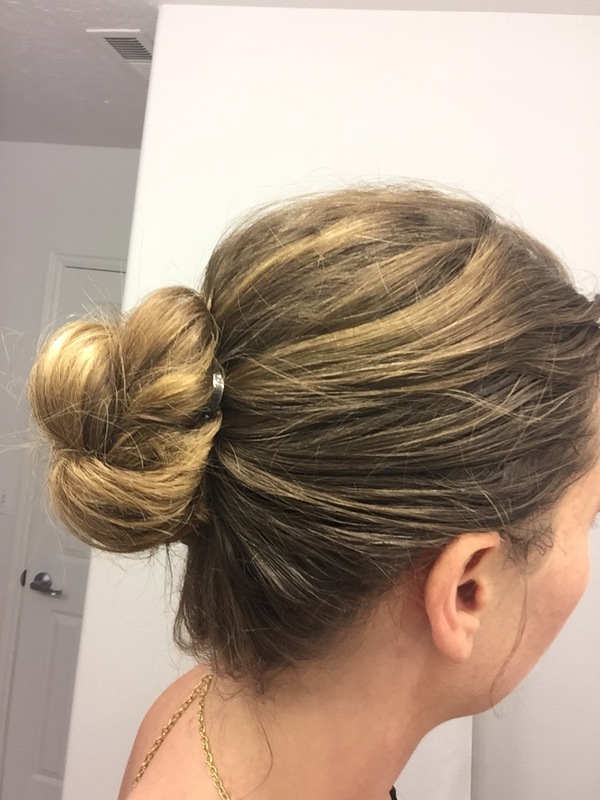 A few years back, I did this so often, my hair stylist told me I had breakage right at the base of my hair where I pull my hair back into ponytails so often. OOPS! Needless to say, I quit doing pony tails quite as often. 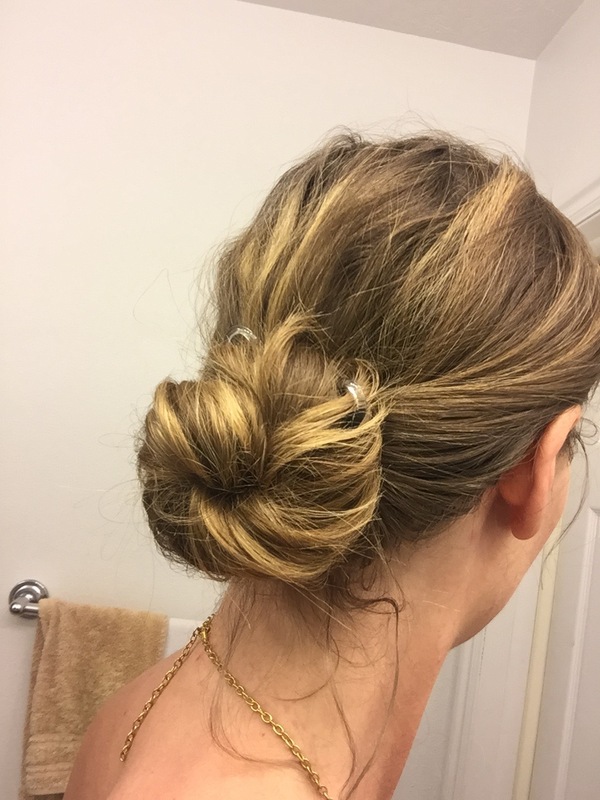 I started getting in the habit of putting my hair into a bun, but still needed an elastic to secure it, and even then, non-elastic elastics are still going to break down hair over time- Eventually! 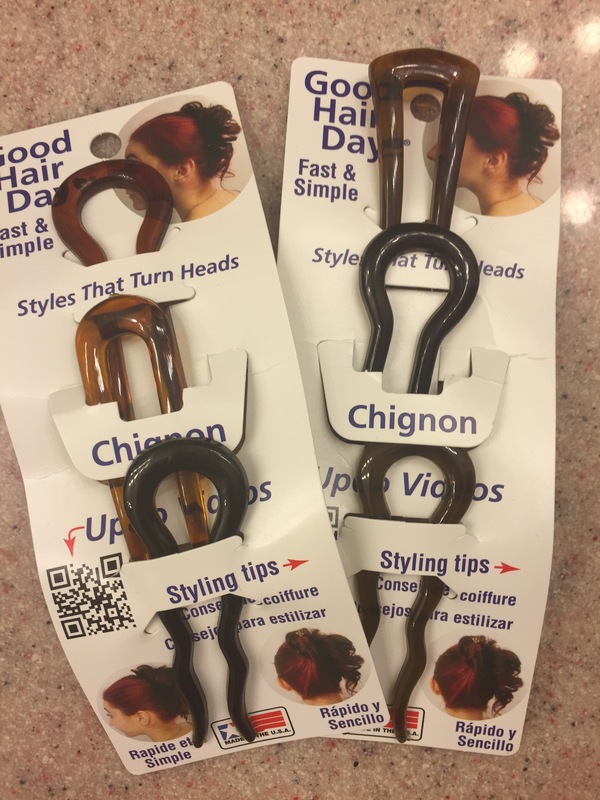 Good Hair Days® accessories are made right here in the USA and are designed to fit the busy ladies’ lifestyle. Just pop your hair up in a bun, french twist, or anything you like, add some of their fabulous style-holding pretty accessories, and voila! You’re done! It’s THAT easy! Here are some of the wonderful accessories I got from the fabulous company to start styling in seconds flat! 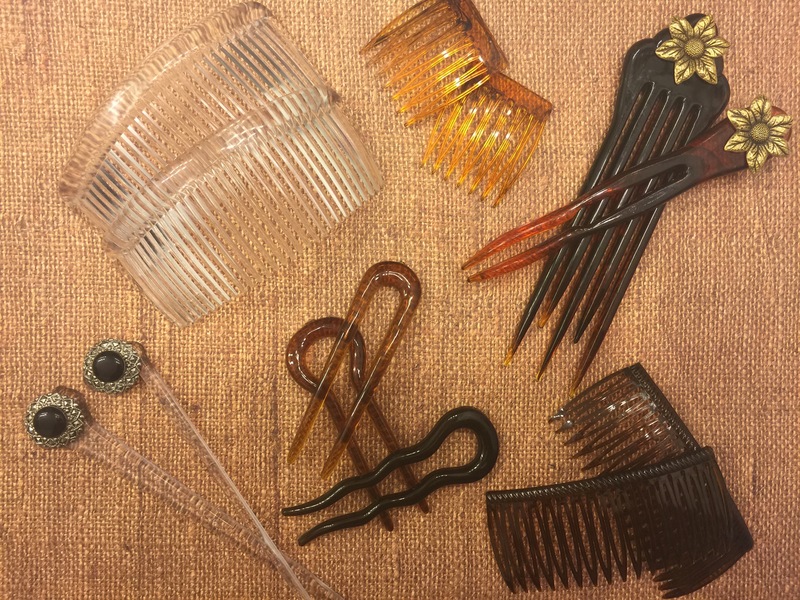 Grip-Tuth® Sidecombs, (available in TONS of different styles, shapes, and colors to match your hair), Magic-Grip® Hair pins, heavy hairpins, and more! Now, a lot of this might look familiar to you already, These are pretty common hair accessories. 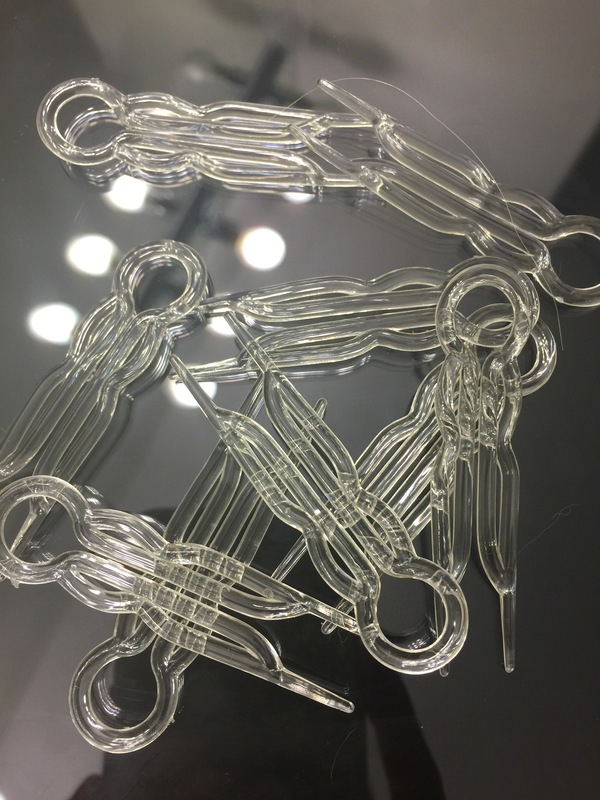 What makes this brand so different, is that each of these pieces flex, so you’re not going to find broken hair pieces in your hair half way through your day, or worse, end up with your style falling out when you have nothing to secure it back with! The Grip-Tuth® brand sold by Good Hair Days® is made from a patented process, involving a super strong, yet flexible plastic. The process is then taken through several more steps to make the teeth then touch each other, so you get a better grip on your hairstyle. This is actually the only brand in the world with touching teeth! The touching teeth actually work like a pin, keeping hair held in place all day long, and comfortably too, I might add! There are also seven different sizes available so you can be sure to find the perfect fit for your head! The curve of the comb was designed to match the curve of your head so that the comb will hold your hair securely at the crown. The comb also gives added volume too! You can also use two combs at the side of our face for a “mane” look, to keep the hair off your face. Yet another great look for those dirty hair days! 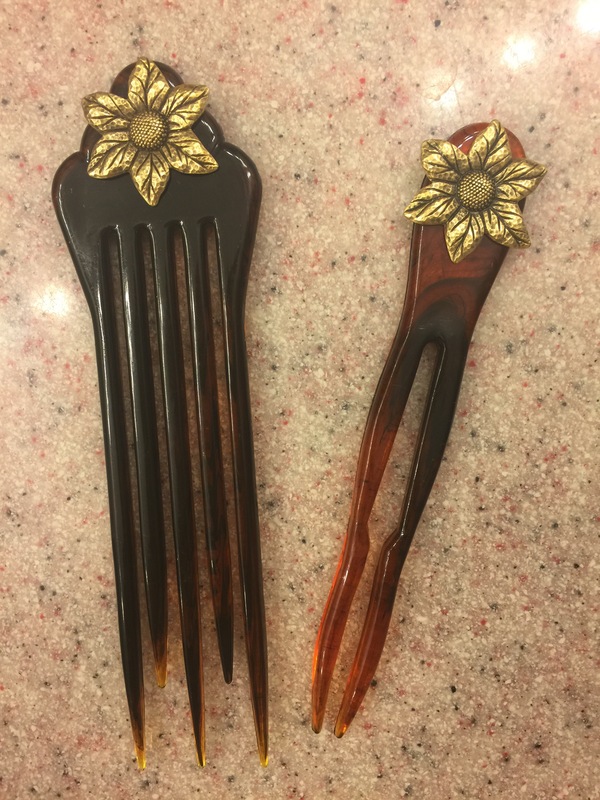 In fact, these amazing side combs can be placed in your hair at all different angles, helping defy gravity, and bringing some instant class to your look! 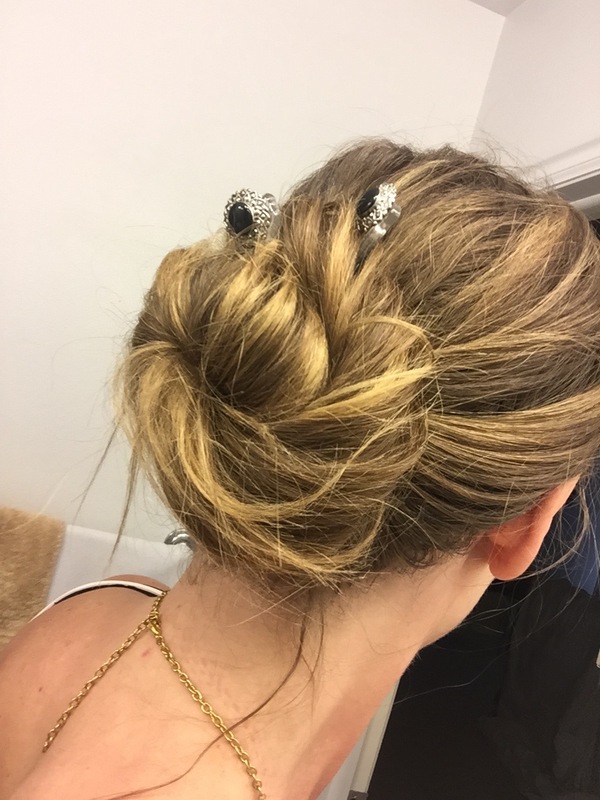 I have to say, after playing around with these fascinating hair clips for a moment or two, and reading up on this info, I got really excited to dig in and start creating looks! Like I said above, I tend to be a bun girl, so I loved the idea of using some hairpins to keep my bun in place in a much gentler, safer way for my hair. I created each of these looks using the different products above. Best of all, each took me two seconds to do! Seriously! It’s incredibly easy! Just gather up your hair in a pony tail, twist, tuck the ends under your hair, and secure with the pins! I was actually really impressed with how well the pins worked too. They went right in easily and I usually got them placed securely on the first try! Just be warned, if you do choose to do an updo, dirty hair is best, as it has more grip and will stay in place. My hair is 2 days past a wash here. If it’s not dirty and you really want an updo that day, just be sure to give your hair a good teasing by backcombing with a brush or comb, to help the accessories grip you hair and hold your style. 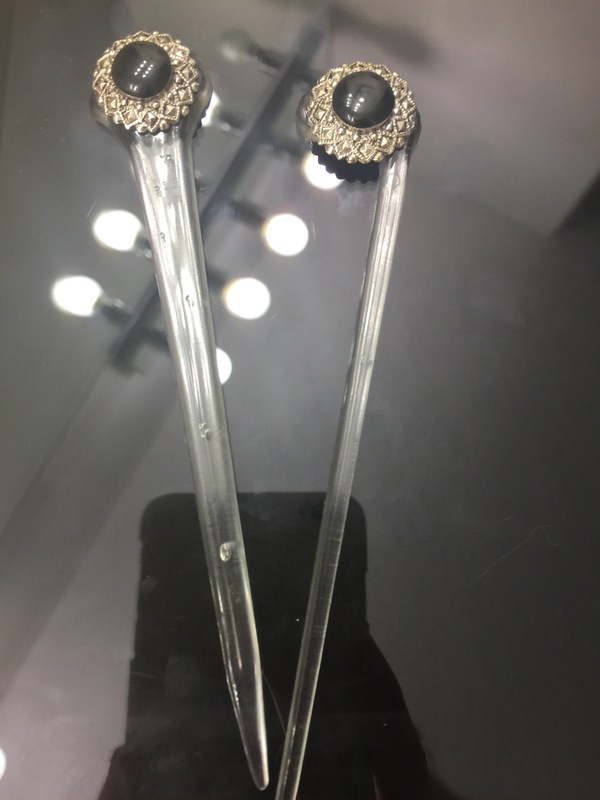 Once the style is fastened, you can spray with a hairspray for extra hold, although I found I didn’t even need it while using these fabulous hair pins and Grip-Tuth® combs. My hair stayed securely in place all day long! If you like a tighter, more slicked back chic style, you can certainly get that as well with Good Hair Days® hair accessories. Just pull your hair into a tight ponytail and wrap tightly! The hair accessories from Good Hair Days® are so incredibly and quick to use, that even little girls could use these. Wow, yeah, teach your little ones how to do it, and you won’t have to use up time in your busy morning styling your little one’s hair as well as your own! Once you start playing with these life-saving hair tools, the creativity will really start coming out, once you realize just how much these fabulous accessories can really do. They really can hold just about any style. I have super long, super thick hair, and they worked great in my mane! Not sure where to start with styling? 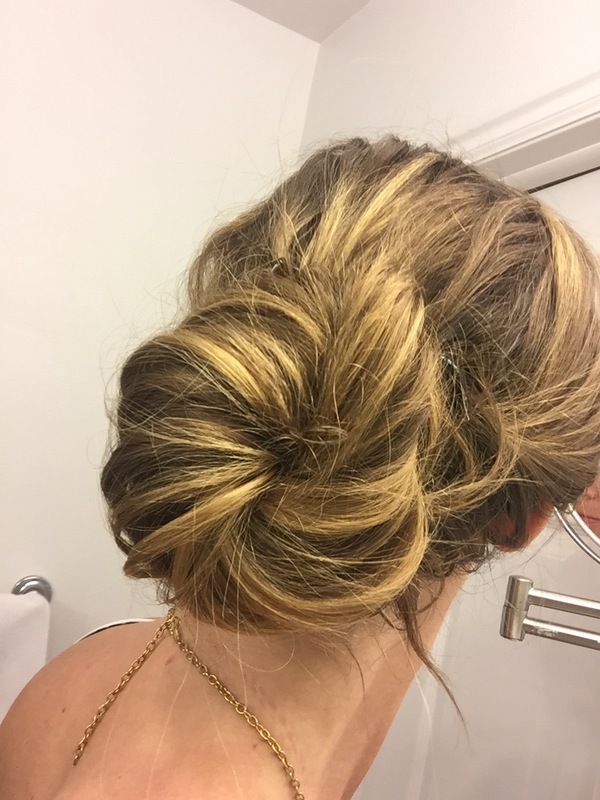 Good Hair Days® has lots of great how-to videos on their youtube channel, so you’ll never run out of ideas! The possiblities are truly endless while using this lovely brands’ hair pins, combs, hairpins, etc, and the good thing is, you only need a few! 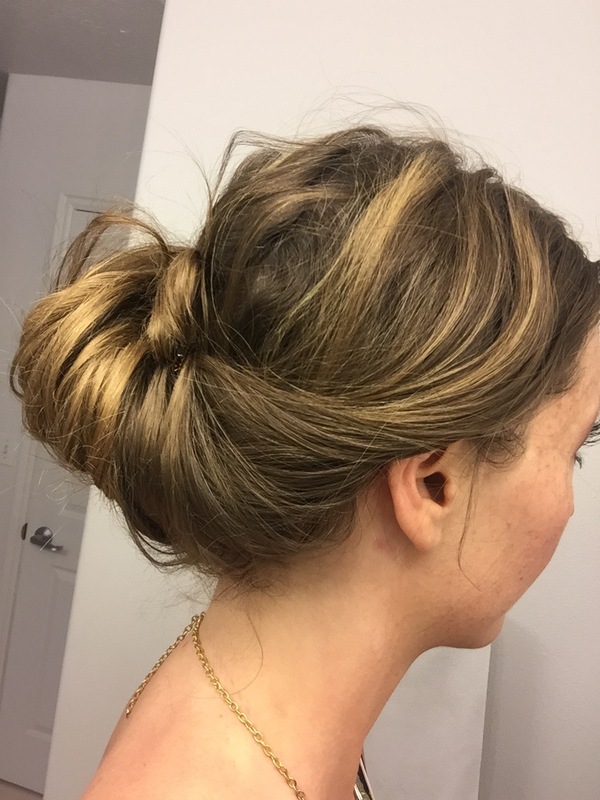 You can save money AND time by using these great hair pieces! Also be sure to check out there super fab barrette collection! Barrettes are making a huge comeback at the moment (just pick up any fashion magazine right now if you don’t believe me)! Barrettes are also great for dirty or lazy hair days. Pop the top part of your hair back for a half undo, and fasten with a barrette. Ta Da, the greasy hair that was lying on your forehead is no-more and you got instant style just like that! Barrettes also look great for placing below a bun or french twist to give your hair instant glam too! Interested in picking up some of the amazing hair accessories shown above from Good Hair Days®! Click HERE to find a retailer near you! Available at Sally Beauty, Walter Drake, Easy Comforts, and many many more! Also be sure to like Good Hair Days® on Facebook for more hair styling inspiration! * I was given these products for the purpose of review. However, all thoughts and opines expressed in this post are solely my own, I only share review with my readers I feel will be beneficial or informative in some way.